After a cooler than normal Spring, our Summer has come for vengeance. I am not sure how much longer I can take the heat and humidity. Not to mention, the daily rain is making it worse. It is making my marathon training very difficult. Instead of looking forward to running, I find myself forcing myself to do it. It's nearly impossible to stay cool while running. Luckily, I had the opportunity to try out a few products from Mission Athletics EnduraCool line which was recently featured on the Today Show! Click here to see the video. 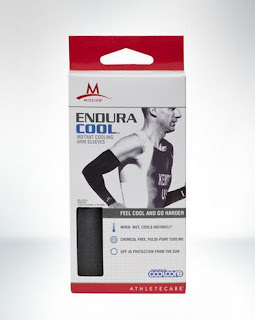 EunduraCool products turn from dry to 60 degrees cool instantly when soaked with water, wrung out, and then snapped in the air to activate the cooling properties. The patented technology, powered by Coolcore™, works by absorbing moisture and perspiration into the fabric core where the unique radiator-like fiber construction circulates water molecules and regulates the rate of evaporation to create a prolonged cooling effect. First up - cooling arm sleeves!! I wear arm sleeves in the winter to stay warm so the thought of wearing arm sleeves to stay cool was a new one for me. It's also SPF 50 so no worries about getting your arms burnt. Do they work? Yes they do. Very well actually. I wore them during a 5 mile run in the middle of the afternoon. After 2 miles in 90 degree heat, I felt the need to re-wet the sleeves since they felt dry. After the run was over and I took the sleeves off, I felt how cool they really were. They stayed that way for hours. My Mom had no idea what they were and picked them up. She was beyond shocked as to how cool they were. EnduraCool also sent me a Mission EnduraCool™ Instant Cooling Towel. Just like the sleeves, the towel instantly cools when soaked with water. I have owned other brands of cooling towels and really liked how this one did not turn rock hard after drying. 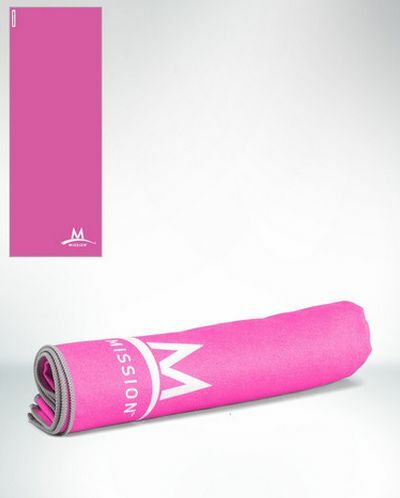 Mission wants to send one of my readers a set of cooling sleeves and a towel! Tell me in a comment below how you stay cool during the summer. If you are an athlete, how do you beat the heat? I try to stay cool by splashing myself with water whenever I can. It's best if there are water stations along your route for this. I stay hydrated to try and keep cool. I do love a cold beer on hot days! I start my run before the sun comes up, freeze my water bottle's overnight (good friend showed me this, wear light colors & stop by cold water fountians along my route. I freeze my water bottles, wear light moisture slicking clothing, and always be sure I take proper nutrition on runs so that I don't get heat exhaustion. I love simple sugars like applesauce packets that are easy to break down and taste delicious. Run inside! Ha, I know that's not a popular one, but it works for me. At least for now! Dude...these are so cool. Chris told me a while back about some cooling arm thing that is being researched right now...they let athletes perform like 70% beyond their usual abilities with strength training, specifically. So these are like the wayyy less intense/crazy expensive version (Don't even think those others are available to the public yet). Anyways, I want these! running before the sun comes up!! and lots of water. I fill my water bottle with ice and water and will even squirt myself to cool off!! I've seen these towels at the store but weren't sure if they actually worked or not. Thanks for the review!! I cool off at the pool. Hello! Wow, this sounds really cool! I struggle with cooling off in the heat. I know this sounds weird, but I don't sweat very much. The result is that I'm at risk for overheating. I had to quit a workout this summer because I got chills and felt cold (sign of overhearing). These products sound awesome! A cooler with water and powerades in it. i keep cool when I run with Columbia's omni-freeze neck gaiter. Wish it came in a slightly smaller size though!